Back to the regularly scheduled green polishes! 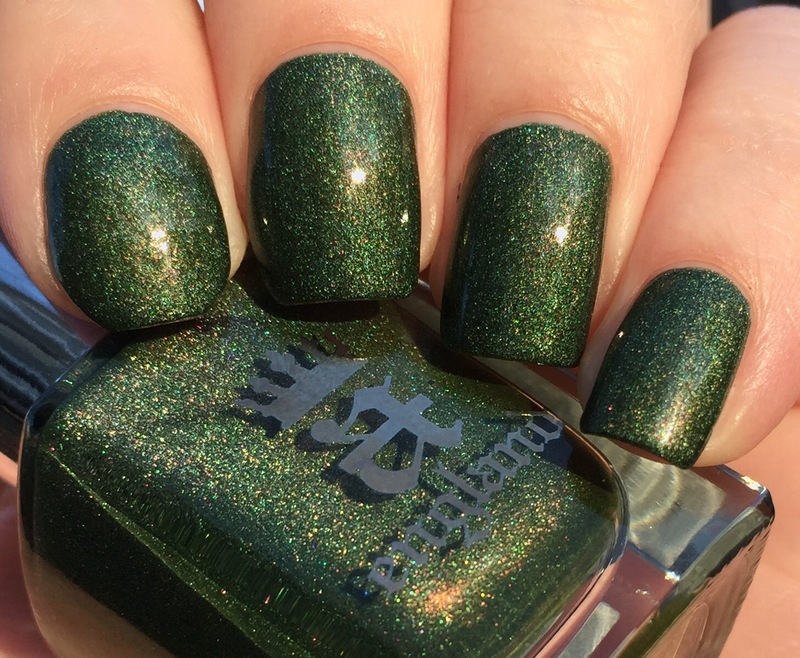 Green polish is one of the things that got me into indies in the first place. I could never quite find what I was looking for among the Essies and Sally Hansons on my local CVS’s shelves, and the first time I laid eyes on a sparkly indie green, I had to know more about what I’d just stumbled on. 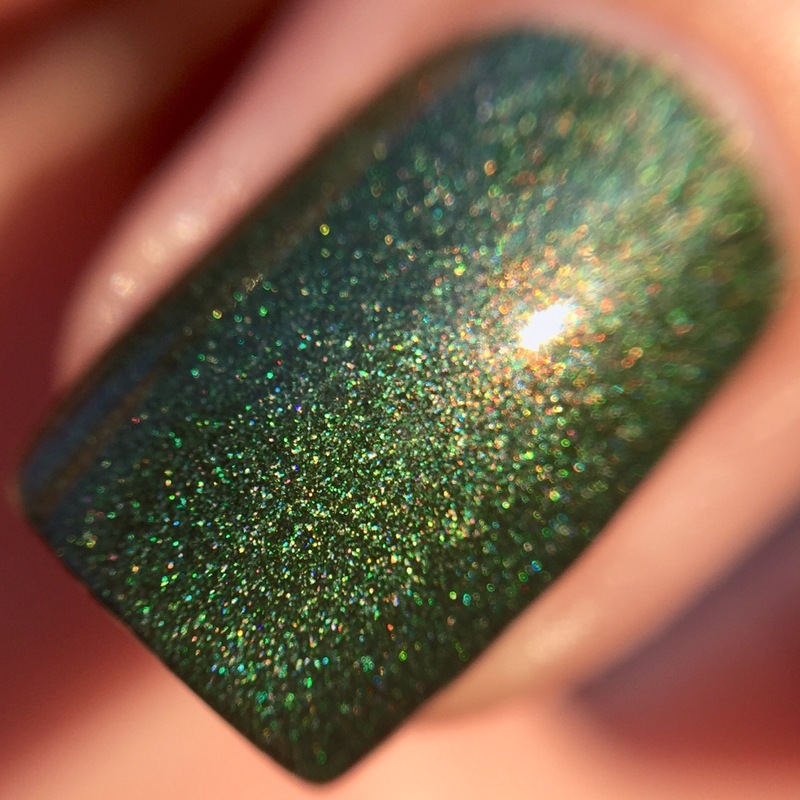 That first sparkly indie green? This. 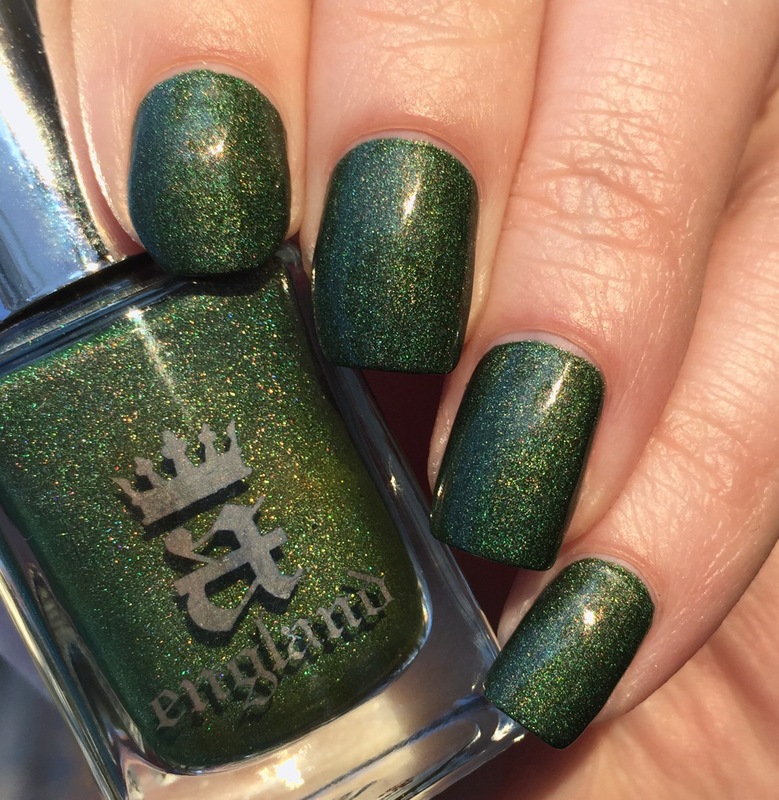 AEngland’s “Dragon.” The subtle linear holo and underlying peachy-copper shimmer were completely irresistible to my indie-uninitiated self four (?!) years ago. Heck, this still knocks my socks off. With my next blogiversary coming up in two weeks, I was thinking about this polish and remembering the beginning of my indie obsession, so I had to share today! This is as amazing today as when I first bought it years ago. I remember being nervous about buying a polish online without being totally sure what it would look like on me. I also remember putting it on my nails and thinking “good lord, what is this dark magic? !” I remember being shocked it was totally opaque in one coat (still is), and being surprised about how easy it was to use (still is). Dragon introduced me to the pure magic of indie polishes: their fab formulas, their unique colors/finishes, and holo. I regret nothing! Eons ago, I bought this on the actual AEngland website. Turns out they don’t ship internationally from the UK anymore, but they do have a number of US stockists, so you have your choice of places to grab it from. What was the polish that first introduced you to indies? Do you remember the moment that sparked the madness? I’m not a green fan but this looks super pretty on you. I can’t believe I let it languish in my Helmer for so long. I think maybe I’ve got a nostalgia week or something to do soon. This is one of my favorite green polishes! My first jumped on the indie train with Nostalgic Lacquer- I got the Bizarre Teenage Love Triangle (or something like that). I think I still have 2 of the 3 shades now! I remember seeing this around, but wasn’t really purchasing much at the time. Wonder if this can still be found? I need! AEngland was my first indie brand before I knew what an indie was. I just saw a pretty polish on Nail Polish Canada and bought it. 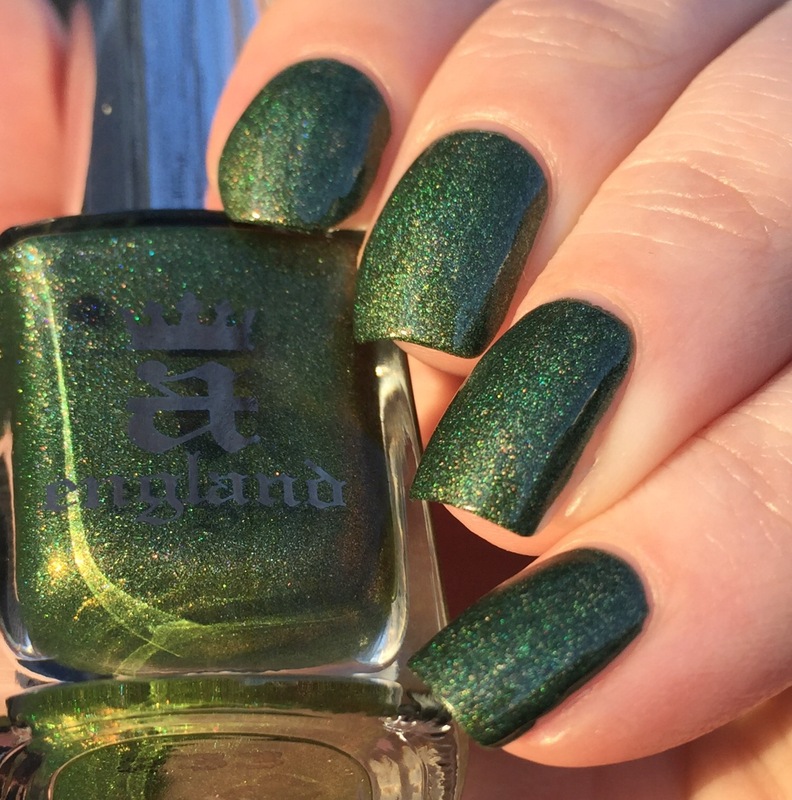 I really need to try AEngland. Beautiful green! I can see it working out great for Holiday manicures but also for anytime of the year. This polish was also one of my first indies! What a classic.